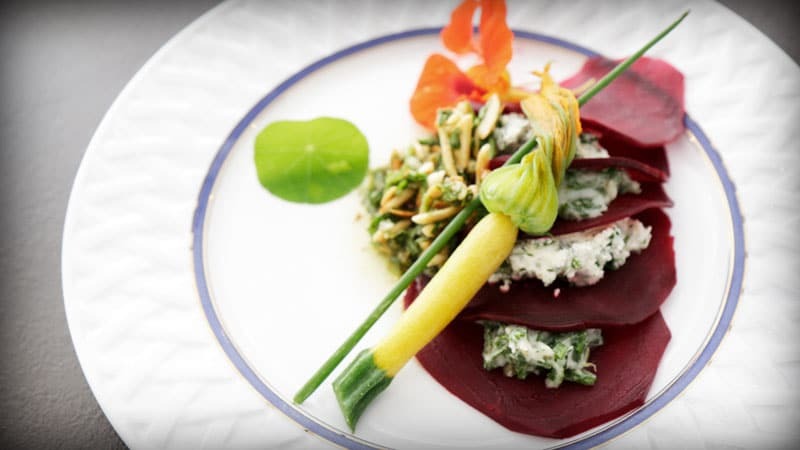 Lucy Vanel, owner of the Plum Lyon Teaching Kitchen, walks you through the preparation of a composed salad with beetroot with fine-herbs seasoned fresh cheese and peppery arugula wilted with hot toasted almonds as an accompaniment. Lively bunches of fresh-clipped herbs make their way into our market basket, to be chopped and folded into fresh farmers cheese and enveloped between delicate layers of thinly sliced herb seasoned beet root for this salad. The herb grouping of fines herbesis part of the vocabulary of any French cook. Composed of equal parts of parsley, chives, and chervil, with the addition of a proportionally smaller part of tarragon(one-half part), these herbs are often grouped together at the market stands for convenience to the cook. In classic French cooking, this grouping is so common that the individual herb names are sometimes not spelled out, with recipes calling for a “handful of fine herbs”. When you compose a bouquet of fines herbes, the first thing to do is to taste each herb individually to get familiar with the flavors. Parsley, chives, chervil and tarragon – different producers along the market can offer the same herbs but with varying degrees of pungency. Follow your taste buds – get familiar with the local offering. Soon you will find a balanced mix that suits your style and your table. 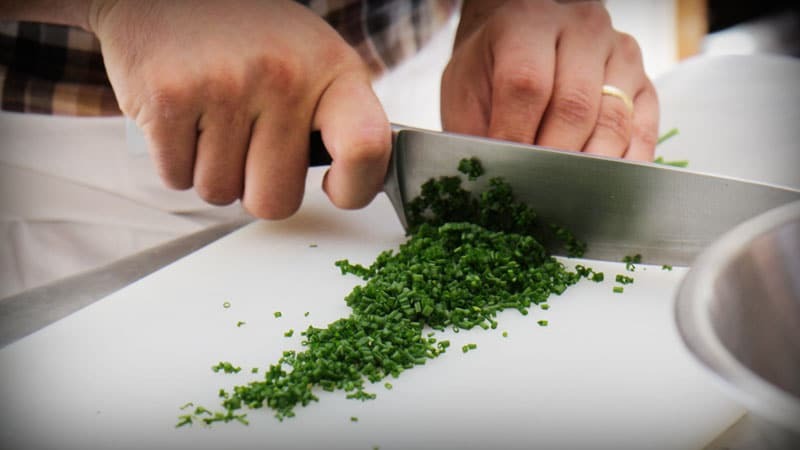 When I want to make this salad, I go out of my way to get the ones that taste best: the needle-thin chives from one producer that always burst with flavor, curly-leaf parsley from a farmer with excellent plants, representing the aromatic true French parsley in the best tradition. I choose chervil that is quivering and perky and not bolted, wilted, or flowering. My choice of the tarragon is the one with the very small spindly leaves, since it has a more subtle flavor that its cousin with wide bush-like leaves. 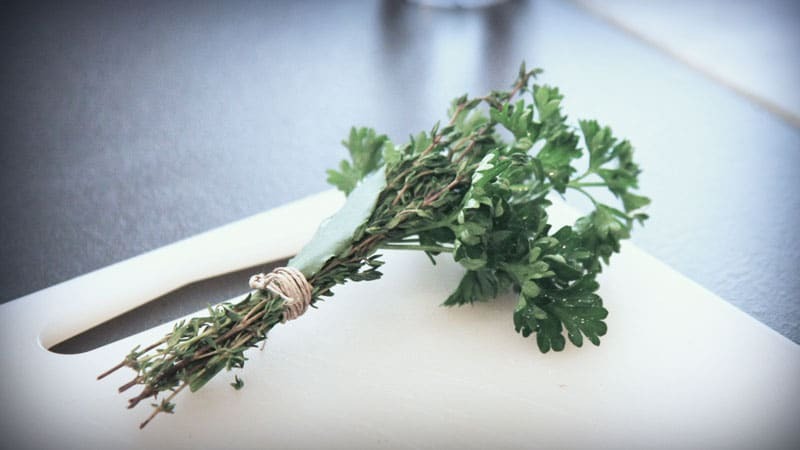 A bouquet garni is another herb grouping, added to slow simmers and stews. Compossed of parsley, French bay leaf and thyme, the aromatic herbs add a welcome complexity to the simmered beet’s flavor. To make sure almonds or other nuts are perfectly toasted every time, I spread them raw on a piece of baking parchment, place them in a cold oven. I then set the temperature to 200C or 400F. When the oven indicates it has heated fully to the temperature (for me, that is a little beep), they are almost done. They will reach a nice golden toasted state within a minute from that time. In the summer, we use rocket (aka arugula), and in the winter, it’s watercress. For this salad, arugula (a.k.a. rocket) is interchangeable with watercress. Use whatever is in season for you. They both provide a bold peppery background for a delicious tasty slaw with lemon juice and fruity olive oil, mellowed and wilted by the hot toasted almonds. Fresh seasonal vegetables, steamed, as desired (we added this summer’s nasturtium cress and bloom, plus a quick-steamed baby zuchinni and flower). You may also simply garnish with sprigs of the fresh herbs you used to season the goat cheese. In a medium saucepan, cover the whole unpeeled beets in cold water and add the bouquet garni: sprigs of thyme and parsley with a bay leaf. Bring to a boil, then lower the heat and let simmer 20 to 25 minutes, until just soft enough to slide a knife into the beet. Strain the beets in the pan, and re-fill the pan with cold water, covering the beets. Peel them under the cool water by slipping the skins off with your hands, or with the help of a paring knife. Reserve. Prepare the fines-herbes seasoned goat cheese: Mince the fines-herbes and garlic, and combine them with cheese, salt and pepper, and olive oil. Reserve the seasoned goat cheese for the plating. Prepare the greens in accompaniment: Place the nuts on a lined cookie sheet in a cold oven and turn on the heat to 400F/200C. While the nuts are toasting, tear the watercress or arugula into small pieces and place in a bowl with the onions, garlic, oil, and lemon juice. Toss to combine. When the nuts are toasted and brown, add them directly from the oven into the bowl with the greens and combine. The hot nuts will wilt the greens a little bit. Season with salt and pepper, and reserve this mixture for plating. These three steps can be done in advance and assembled just before serving. Cut the beets into thin slices just before plating. Plating: Layer thinly sliced beets alternately with dollops of the goat cheese mixture 5 or 6 times, either one on top of another or layered around the edge of the plate. Place a mound of the accompanying greens next to the beets and herbed goat cheese, or drizzle the stacks of beet and cheese with the greens and almond mixture scattered around the plate. Garnish with fresh herb leaves, edible flowers, or steamed vegetables as desired. I like to serve this with a St. Véran, an un-oaked Burgundy white wine. Note: The nuts can be replaced with whatever nut is local and seasonal to you. Because I teach traditional French Pastry workshops all year round, I use a lot of almonds and always have them on hand, so that is what we use. However walnuts, hazelnuts or pecans are all possibilities.